Collateral war time damage, but did the author mention the 173 crush deaths at Bethnal Green Station. It sounds like an interesting book. Yes, he did mention the deaths at Bethnal Green, and did spend some time on it, recording the names of the people who died there. But again, a fairly top-down report-style approach- few eyewitness quotes etc. Hmm, interesting. 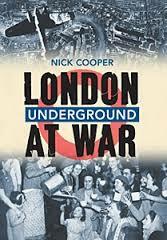 Of course there is a place for a matter-of-fact history of the underground, but there is an emotional/patriotic side to its history as well and I think it’s only telling half the story to omit it.